Scott Simpson smiled at the crowd after making a birdie putt on the 17th hole during yesterday's final round. Scott Simpson admitted to sensing the pressure stepping up to the tee on the final hole of the Turtle Bay Championship. Having drained a clutch birdie putt moments earlier, Simpson found himself tied for the lead of the first full-field event of the Champions Tour season. But rather than let the tension lock up his swing on the Arnold Palmer Course's 18th tee, Simpson -- who last won a tournament eight years ago -- relished the situation. "You bet I felt pressure," he said. "That's the fun part. You feel pressure, so you've got to calm your nerves, and stick to your routine and make a good swing." 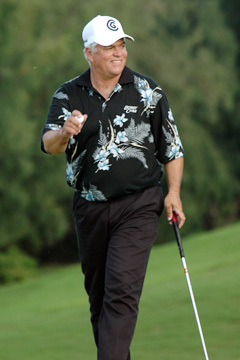 The former Kailua resident certainly did that, nailing his drive right down the middle of the fairway. Unfortunately for Simpson, Loren Roberts matched him off the tee, then did him one better on his second shot on his way to winning the $1.5 million tournament. Roberts fired his approach to within 9 feet of the hole and drained the eagle putt to finish the tournament at 12-under 204, two strokes ahead of Simpson. Simpson carded a 2-under 70 yesterday to post his best finish on the Champions Tour. His last victory came at the Buick Invitational in 1998. He played in four events on the senior tour in 2005 after turning 50 last September, and an 18th-place finish at the SAS Championship was his top showing. Like most folks, Simpson arrived at the course yesterday thinking Roberts would cruise to the title after making short work of the 7,044-yard seaside course in the first two rounds. Already trailing by four strokes, Simpson began the final round with a bogey, but got a break when Roberts missed a short birdie putt. He hung close with a birdie on the par-3 fourth hole and another on No. 14. He finally caught Roberts on No. 17 by hitting a 9-iron to within 12 feet of the cup and rolling in the birdie putt. "I was thinking, 'This is really fun, this is so cool,' " Simpson said of the walk up to the final tee. "It was just fun to be up there in contention." "That's something Parker (McLachlin) told me a couple weeks ago," Simpson said, recalling his weekend spent caddying for the Punahou graduate at the Sony Open in Hawaii. "He holed a bunker shot and he comes out of the bunker and he looks at me with a big smile and he says, 'This is really fun.' And I said, 'It should be.' It's a game and when you hit good shots, it should be fun." Simpson hadn't performed well on No. 18 earlier in the tournament, but picked the right time to come up with one of his best swings of the event. "I hit two horrible drives there the last two days, in the trees both days," he said. "Today I just hit it perfect, just ripped it. Down the middle, That was really cool." Both players pulled out 4-irons, and Roberts put the pressure on with his dart to the green. Simpson's shot from the edge of the rough flew over the flag, setting him up with a 50-foot putt. "I couldn't tell how close it was," Simpson said of Roberts' shot. "Obviously I heard everyone clap, so I knew it was pretty close. So I actually did play my second shot a little bit farther right than I might have. "But all I could do, especially from that lie, was just try to make a real good swing and I did. I hit it really good." Simpson's lengthy putt missed to the right and Roberts secured the championship when his putt broke into the cup. Despite coming a bit short, Simpson had no complaints about his start to the season. "Overall I'm really pleased," he said. "The first tournament of the year and not only coming in second but also to play really well, I'm really happy." Simpson was part of a pack chasing Roberts much of the day. Roberts raised the hopes of the rest of the field with two bogeys on the front nine and made the turn tied with Bruce Summerhays and Isao Aoki at 10 under. Summerhays strung together birdies on Nos. 7, 8 and 9 to catch Roberts, but played the next four holes at 4 over par to drop out of contention. Aoki dropped out of the lead with a bogey on No. 10 and saw four birdie opportunities slide just past the cup on the back nine. He closed with a birdie on No. 18 to move to 9 under and stayed around the green for a while in case the leaders faltered on the final hole. But that possibility evaporated with Roberts' remarkable approach shot. "You get out in front and you're kind of expected to finish it off and the guys behind you don't have anything to lose," Roberts said.